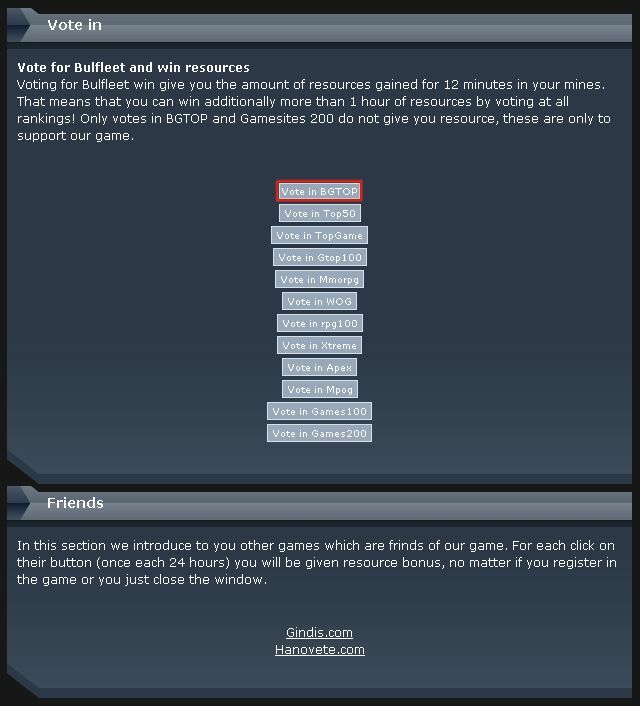 Upon click on the “Vote for Bulfleet and win resources” add, you open a menu that helps the game gaining popularity. In favor of your support, you receive resources. You will see few buttons in the center of the page. Each one leads to a different rate page. Clicking on a button opens a new browser popup window with the chosen page. Wait until it is loaded and vote for Bulfleet. After that, close that window and you will be redirected to a new page with our gratitude and information of your profit. Click the Back button of your browser and proceed that way with the next link. You can vote once a day. Once voted, the link to the chart disappears for the next 24 hours. Each vote applies to your account your 12-minute income of your mines on the planet you are at the vote time. The only exception is the BGTOP Chart, where your vote just helps us to gain popularity.